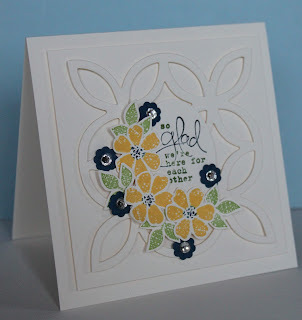 Just Julie B's Stampin' Space: CASing Mary Brown! Today I was looking for some ideas for some quick cards with a couple of the Sale-A-Bration sets, and I came across this one by Mary Brown. (I always like Mary's neat and clean stamping style.) Even though it wasn't such a 'quick' card to make, I love it A LOT! - So I had to CASE it, with a few minor changes! OK, well I'm off to find some more 'quick' cards to make!! I may have to case yours! Love it! !